Picking up where it cut off…. 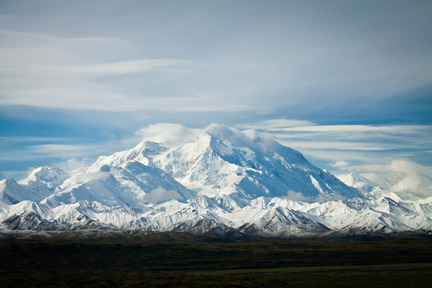 Alaskans thought the name, McKinley, was irrelevant and in 1975 petitioned Congress to change the name back to Denali. 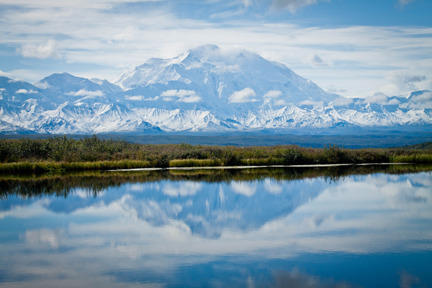 In 1980, Congress did that…changing the name of the park to Denali National Park and Preserve and enlarged the area to 6 million acres. Bus one Ohio congressman was able to keep Congress from changing the name of the mountain itself by using a little known rule. Because McKinley was a former governor and congressman from Ohio a successor in his district he wanted the mountain to remain McKinley. He was able to block the change of the mountain’s name. Thus the mountain is still Mt. McKinley, officially. 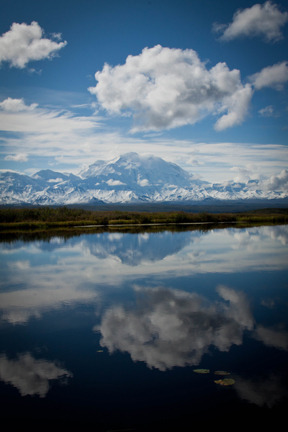 I made three trips to Wonder Lake during my five days at Denali. The first was to camp on Friday and I’ve already posted a picture of that sunrise on Saturday morning. On Sunday, it snowed heavily once we reached the 3000 ft. level and it was so cloudy you couldn’t see across the valley to any of the mountain range. My friends in Buffalo won’t find this picture any big deal since we had this kind of snow all the time. But not in August. After we reached Wonder Lake the skies cleared. The sun came out and this is what we got. On Monday, I made my third trip to Wonder Lake with the hope of getting a shot of the mountain reflected in Reflection Pond. 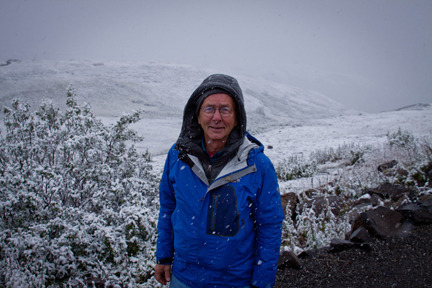 It is a 3/4 mile hike off the main road and then a 1/2 mile hike to the lake through tiaga…spongy, tundra. Going down to the lake wasn’t too bad but the climb back up left me wondering if I was going to have a coronary. I was sweating profusely and breathing hard. Walking up on the tiaga was very difficult…at least for me. Everything needs to fall into place. No wind so the pond is as smooth as glass, sunny skies and the mountain needs to be visible, obviously. I made the hike with another photographer I met on the bus from Clemson, SC. Here’s the result. Every year a large number of climbers attempt to summit the mountain. They are required to submit an application with a resume of their climbing experience. The park service can’t refuse anyone from attempting the climb but they do try to discourage climbers who don’t have the experience they feel is necessary to make it. The climbing season is mid-April to mid-July. This year 1204 climbers started the climb and just over half made it. Fifty-three percent to be exact. Seven died. The preferred climb is from the southern side. The climbers are airlifted to base camp at approximately 7000 feet then they have a 15 mile trek to the top that takes about three weeks. They climb a ways, cache their supplies at one height, retreat lower to acclimate. Then they climb to their cache and move it higher. Then retreat to a lower level and go through this process over and over again. In all they probably hike 100 miles to cover the 15 to the top. Climbers are required to be able to self-rescue. When that can’t happen, there is a team of Climbing Rangers that stay on the mountain for 30 days at a time to handle rescues. Every 30 days they rotate off to another group. If the Climbing Rangers can’t handle the rescue, there are high altitude helicopters available and finally, the Army will come at the last minute as part of a training exercise if all else fails. On our two trips on Sunday and Monday we saw some interesting wildlife including the bear that had thrown his body on top of the caribou that I sent along on Saturday’s post. I’ll pick that up next time. I remember that hike to what we thought was Reflection pond. I thought I was going to have a heart attack too. 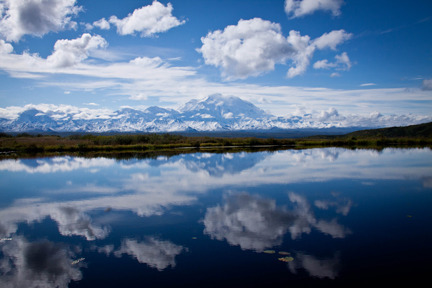 I revisited there 3 months later for the Denali Road Lottery (you can drive a private vehicle) and just over the next hill was the actual place called Reflection Pond. But, these images are actually better I think. David – Clemson SC.